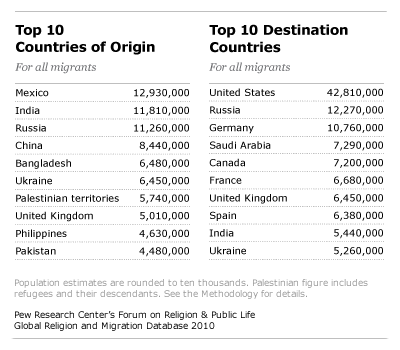 See the Pew Research Center’s Global Migration Estimates for 2010, including interactives and data. With recent reports of migrants risking their lives crossing the Mediterranean, Roma communities on the move throughout Europe and alleged abuses of migrant workers in the Middle East, one of the most frequently asked question is: How many migrants are there in the world? Of course, international migrants are not in one place. They have as many origins and destinations as there are countries and territories in the world. And they stay in the destination country for different lengths of time – months, years, and sometimes their entire lives. In some parts of the world, particularly in Europe and the Middle East, the rapid influx of migrants has become a source of economic strain, humanitarian concern and public policy debate. By definition, a migrant moves. But migrants typically don’t move just once. Migrants may move to one country, stay a while and move to another place. In Europe, for example, a migrant from Romania may find work in Spain, get laid off and try getting a job in the UK before making a return trip home. Not surprisingly, all this movement is difficult to track. 2Who is an international migrant? In describing immigrants, many countries follow the foreign-born rule – a person who is born outside of the country in which they now live. But not all countries follow this convention. For example, Germany primarily counts foreign citizens (those without German nationality), not the foreign-born (those born outside of Germany). For example, migrants who entered Germany as “returning” migrants of German descent are not, from Germany’s perspective, counted as migrants, even though they were born in Poland, Russia or another country. This can lead to very different estimates. In 2010, the number of foreign citizens approached 7 million in Germany, but the total foreign-born population (including “returning Germans born outside of Germany”) is over 10 million. We have been estimating the number of unauthorized immigrants in the U.S. for some time. But unauthorized migration is also an issue for other destination countries. For example, the UK has recently encouraged visa over-stayers to leave the country with mobile texts, but the British government’s detection system of who is or is not an unauthorized immigrant remains uncertain. Americans are accustomed to hearing an annual estimate of the number and detailed origins of immigrants from the U.S. Census Bureau. But not all countries are as forthcoming. For example, several countries in the oil-rich Persian Gulf, such as Qatar, do not provide detailed estimates of the origins of their immigrants, even though such data is collected via their immigrant visa system. With such explosive growth of migrants to these new destinations, such data can be politically sensitive. If someone moves from the U.S. to Canada, they may or may not inform the U.S. State Department that they made a move, but the Canadian census would have a record of them living in Canada. Consequently, migration statistics at the destination end of migration is much better known than on the origin side. Countries where monetary remittances sent back by emigrants contribute to a large share of their economies do track the out-migration of their citizens. But for many of the reasons explained above, this data is not always reliable or current. Despite these challenges, there are efforts to standardize migrant statistics. Meanwhile, organizations like the World Bank, Pew Research and the United Nations do their best to work with the data that is available. The estimates vary in quality, by definition and by availability from country to country. But when added altogether, it is certain that much of the world’s population is on the move.